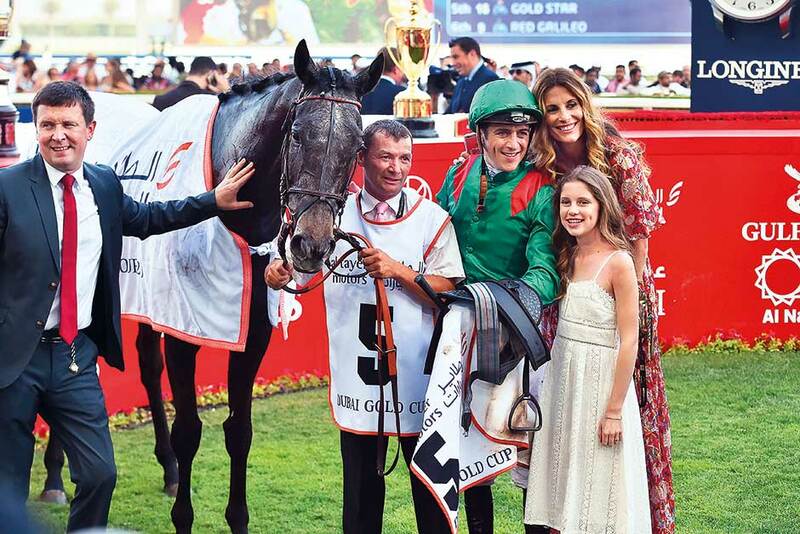 Dubai: Big race jockey Christophe Soumillion was full of praise for Vazirabad after the French-trained stayer made history by completing a rare hat-trick of victories in the £1 million Dubai Gold Cup sponsored by Al Tayer Motors. In the process Vazirabad broke the track record time of 3:18.84 over 3,200 metres — set by Brown Panther in 2015. Vazirabad clocked a time of 3:17.92. Sheikhzayedroad, a big favourite in Dubai, was a length behind in second for jockey Martin Haley while William Buick’s Rare Rhythm ran on for third, a half-length further back. Soumillon said: “He is simply such a great horse and I am superbly pleased to be with him. “He’s been incredible, and for him to make such a comeback shows his true character and class. He was confident all along and today he showed why he can safely enter the history books. Just like last year, French trainer Alain de Royer-Dupre’s six-year-old was the hot favourite and he lived up to the hype in glorious fashion with a stunning come-from-behind victory in the longest race at the meeting. Godolphin’s Frontiersman and Red Galileo led for most of the gruelling trip and the pair were clear by at least 10 lengths as the field straightened for the home run. However, Soumillon, who is an outstanding judge of pace was content to bide his time aboard Vazirabad before he went to work approaching the final two furlongs. The response was immediate as the son of German stallion Manduro found another set of gears, reminiscent of some of the classy French sports cars, to power through for a cosy win in the end. The performance was not lost on Royer-Dupre, who said: “I found him more relaxed and stronger than before. He definitely showed a strong pace today. “At first he managed to stay put in the crowd and then made his move at the perfect time. I am sure no one expected that flourish from him. “There was no secret in what you’ve just seen. When you come to Dubai, you come to give off your best and that is exactly what he has done today,” he added. “You’ve simply got to do what you’re meant to be doing on such a big race night. 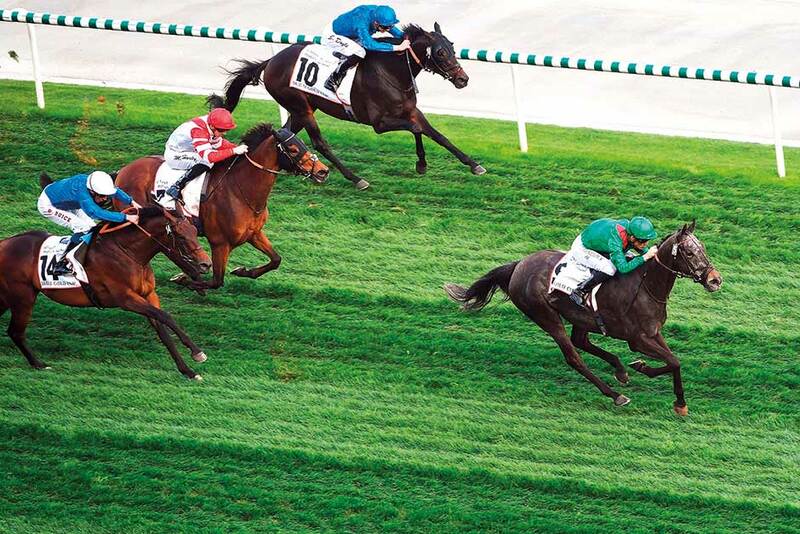 Georges Rimaud, racing manager to Vazirabad’s owner, Aga Khan said: “We were not really worried at any stage. With Christophe on board we trust him. “The race was not unlike last year’s I think, he won with a bit more of a margin. David Simcock was full of praise for runner-up Sheikzayedroad and said: “Absolutely thrilled to bits. At the age of nine, to come out here and to run this race first time. Improve and come second to an exceptional stayer, makes us very happy. “We might just change plans slightly, the fact that this place suits him better than any, the climate, the timing, timing of two races together, what we might do is think twice about some of the races gone to previously and maybe come back next year, we’ll see,” added Simcock.